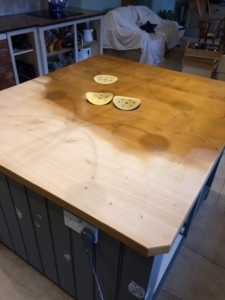 Worktop refinishing is basically working with the worktops you already have but making them look like a new and completely different design. We can use microcement to give a modern concrete style finish that is very popular in Spain and Italy (where it originates), see our blog post on this. Alternatively we can use a resin system where we can incorporate many- colour techniques from a plainer design that can mimic anything from stone tops to a super pink worktop with silver glitter! There are also options to layer a printed graphic underneath the surface which is then covered in the hard-wearing resin. All of these products are designed to be long lasting and have UV and water protection. They can even incorporate antibacterial properties into the surface which can stop the spread of common bacteria that may get on your kitchen surfaces. 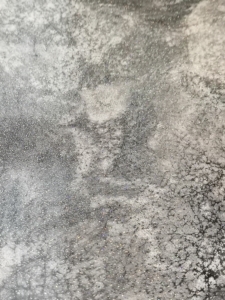 We are currently experimenting with some other designs and materials which will then offer further ideas for resurfacing your worktops. These will be shown in the new year, and we can bring you samples to look at when we come and quote. The other advantage of these products is we could make you a matching upstand or splashback. The finish could continue down your end panels to give you a more unique modern look to your kitchen. We recommend looking at the blog page to get a visual idea of what is possible. If you have a design idea then then give us a call to discus see what is possible with Kitchen Edit. 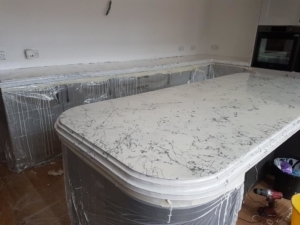 If you have your heart set on a waney edge timber worktop or a certain type of granite we can help with this too as we work with some dedicated worktop suppliers and fitters who can make this happen.